2028 – February 6, 2019 – It’s the morning after (the SOTU), do feel better or worse? There are more women in the halls of congress than ever before, ranging from the (Too Old Guard) Pelosi to the (Young Unknowledgeable) Cortez. Who will come out on top? 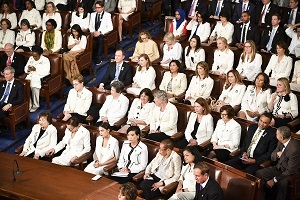 The ones in white made a statement, as did those who did not conform. A handful of Dimms chose not to attend, for various reasons, all amounting to the fact that they just don’t like POTUS. It was a great speech, with great quoteable moments, but you will have to listen to this podcast, or watch the Facebook video, to hear BETH Ann’s favorites.